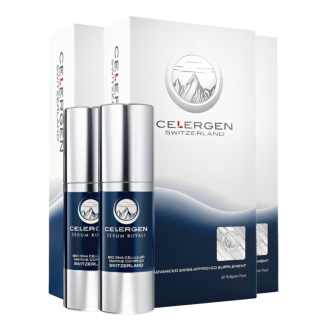 Encapsulating the transformative power of cell regeneration therapy, Celergen aims to awaken your dormant cells, restoring your mind and body to its former, youthful self. Extracted from deep sea salmon and herring, the three key ingredients are composed of our proprietary – whole body healing – BioDNA Cellular Marine Complex, Peptide E Collagen and Hydro MN Peptide. Other ingredients include Lutein, Grape Skin extract, selenium and Co-enzyme Q10. For optimal absorption into your bloodstream, take Celergen with water, on an empty stomach at least one half hour before eating. The most ideal times of day are in the morning before breakfast, or in the evening before retiring to bed. Doctors recommend taking at least one capsule daily for a minimum of 4 to 6 months to experience a full realization of benefits. For more serious conditions, take 2 capsules daily for the first month and then 1 capsule daily the months after. 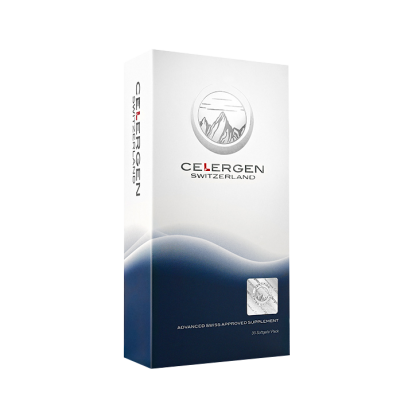 More than 80% of Celergen Users Reported Overall Improvement In Joint Pain After Using Celergen. Click/Tap to Learn More. Nearly 80% of Respondents Reported "Significant Improvement" in Energy. Click/ Tap to Learn More. Patients Suffering From Conditions Related to Mental Fatigue, Reported Significantly Improved Concentration, Memory and Overall Mental Well Being. Click/Tap to Learn More. A Recent Clinical Study Shows That Celergen Helps to Significantly Improve Circulation. Click/ Tap to Learn More. A Recent Clinical Study Shows That Celergen Helps to Significantly Reduce Internal Inflammation. Click/ Tap to Learn More. Clinical Studies Show That Celergen Helps to Increase Stamina & Hasten Post-Exercise Recovery. Click/Tap to Learn More. 71% of study participants showed "significant" reduction in deep wrinkles. 77% of study participants had fine wrinkles completely disappear. A 30 day study, revealed significant reduction in "Crows Feet" for Volunteers averaging between 40 and 55 years old. A clinical study on 30 volunteers showed overall improvement in skin thickness, elasticity and dryness. 22 participants treated with Celergen showed significant increase in protection from over-exposure to the sun's UV Radiation. Celergen users have reported healthier, stronger nails. A new clinical study shows that Celergen helps to significantly improve wound healing. Celergen users have not only reported healthier, fuller hair, but hair returning from gray to its natural color.